April Fools Day is all about having fun, it’s basically the only day in the year where you can mess around like a prat and get away with it with three simple words. 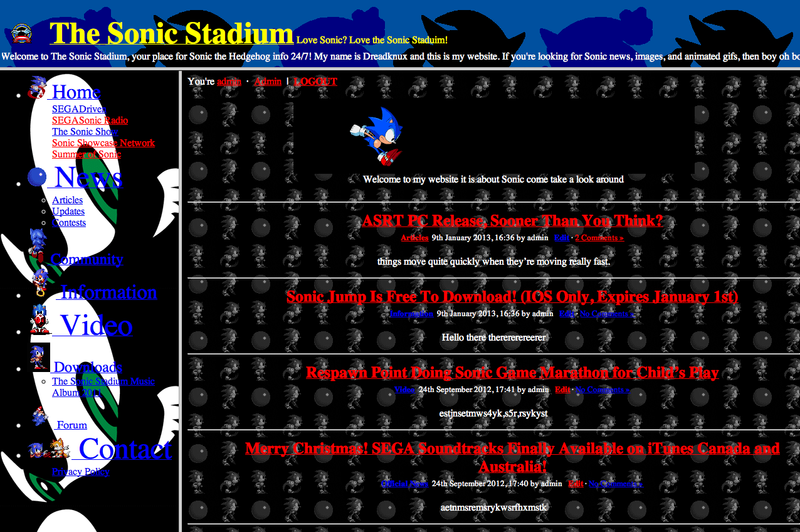 The Sonic Stadium, being completely and utterly British, naturally follows this trend to the letter. Or phrase. Check out previous pranks below. No April Fools joke ran this year due to a server crash. A bot was placed on SSMB posting rubbish and spamming the forums for days, and on April 1 we announced ‘Sonic Fanatic’ was the site/forum’s best member ever. We had toyed with the idea of providing an interactive card game on The Sonic Stadium for many years… in a somewhat cruel gag, we ‘finally’ ‘launched’ the feature to our community, only for them to encounter a large number of ‘errors’ whenever they tried to do anything. A lot of work went into this fake story about a leaked Knuckles the Echidna game on Nintendo DS. A forum member from SSMB helped create these mock images of the title, which would apparently see Knuckles use ‘Punch Gears’ to tackle various obstacles. With the discovery of Sonic 2 Beta now the stuff of legend, TSS spent the day on 1 April 2009 by ‘revealing’ a newly discovered fact – the origin of Super Tails. It was short, cute and quirky and was an added nod to the retro hacking community to boot. Something’s biting! 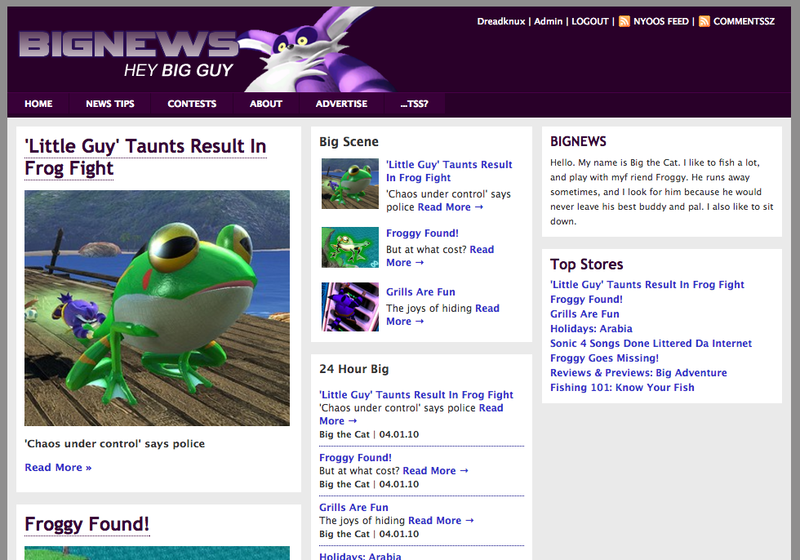 Big the Cat took over The Sonic Stadium on this day, becoming chief reporter on all things large, purple and fluffy. A lot of these stories ended up being about Froggy in some way, but the audience seemed to really love it – and you’ve got to give the people what they want! Oh dear, oh dear! The Chuckle Brothers, consisting of UK-based kids’ comedy duo Paul and Barry Chuckle (of ChuckleVision fame) became the proud new owners of TSS for a day. It’s probably not something you’d understand unless you were a kid growing up in the UK during the 1980s – 1990s. 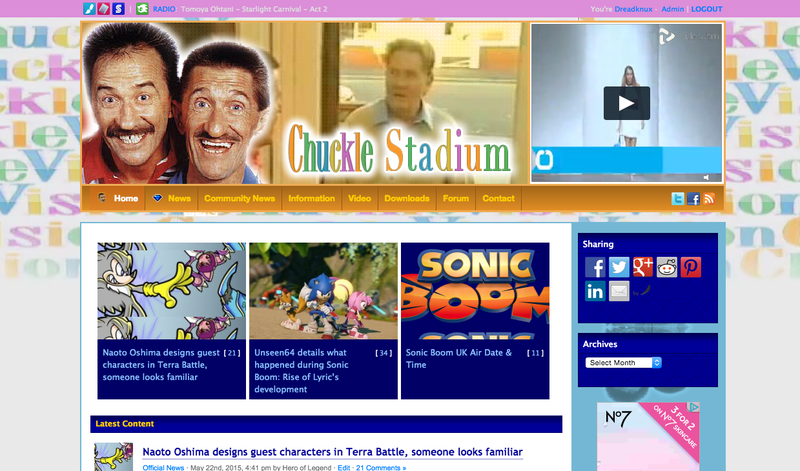 But then the whole thing started as an in-joke anyway, with SSMB Forum members changing their names to some form of ‘Chuckle’ brother on AFD the year before. To me, to you! 1990s pop group Right Said Fred were in talks with Cash Cash to produce a modern remix of their ‘hit’ song Wonderman (which was released to promote the release of Sonic 3)… if you believed our April Fools Day story, of course. Truth is, this wasn’t happening at all. But we kind of wish it would. Ah, the World Wide Web. The Information Superhighway. The Dial-up Frontier. Things were certainly much simpler back in the late 1990s, and on AFD 2013 we illustrate this by going totally retro with the front page! Marquee text, huge animated sprite gifs, theme colour mismatches and non-transparent garish background images – feels like 1997 never left. Fake a movie script, write it about Sonic, make it look genuine (which to be honest wasn’t that hard but UGH effort) and take some dodgy looking photos, et voila – your very own film-related April Fools Day gag. This one tripped up a number of you, which made us feel pretty bad by the time we made the big reveal. All in good fun though, right? This is probably our finest work. We created an entire announcement for a Remastered version of Sonic 2006. Because if any game really needs a do-over, it’s that one. We even created a convincing trailer for it – who knew that SEGA could deliver 4K graphics on a Dreamcast? – by editing existing footage and turning up the bloom/sharpness. We’re still getting people confused about whether it’s real or not on YouTube, even though the video is clearly labelled AFD 2015. So yeah, pretty good job. Our favourite fat feline is at it again – this time he’s given up life as a cool BIGNEWS journalist and instead is trying his hand at viral, social media-friendly ‘content’ creation. 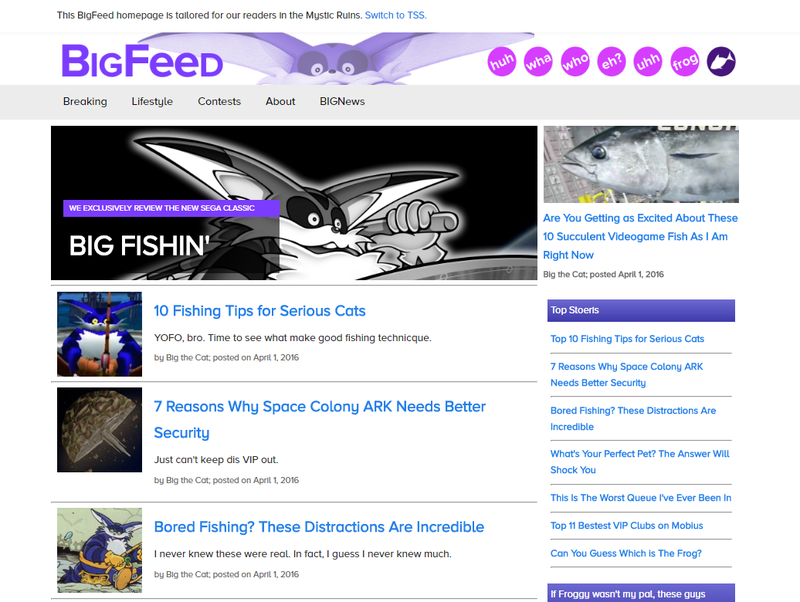 The result is BigFeed, your ultimate source of Big the Cat wisdom, in sharable chunks! Learn about the best fishing tips, find out which pet you would be most compatible with and read the exclusive review of Big’s Big Fishing Adventure 3. We crafted a story about SEGA announcing Big the Cat as a playable character in Sonic Mania, after a ‘TSS investigation’ found that the developers wanted to build a cross-promotion with the fan-made Big’s Big Fishing Adventure 3 game. How excellently cheeky of us!